Over the course of 18 days during the period from April 15 to June 15, Mike Oblinski chased storms through nine states. In the process, he put 20,000 miles on his vehicle. All of that driving resulted in the capture of nearly 60,000 images that he then edited into the brilliant timelapse, "Vorticity," seen below. 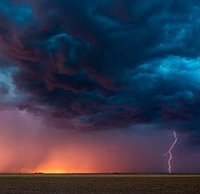 Oblinski states that his three goals for the spring were to "capture a tornado on time-lapse, capture the best footage I possibly could and chase as much as my schedule would allow." Not to spoil the video below, but he accomplished all of his goals. The time-lapse video below was shot using Canon 5DS R and 5D Mark III cameras and Canon 11-24mm, 16-35mm, 35mm, 50mm and 135mm lenses. The images were processed in Lightroom and edited into the video using LR Timelapse, Adobe After Effects and Adobe Premiere Pro. Oblinski is a very interesting -- and talented -- photographer. Year-round, he is a wedding photographer and most of the year he photographs family portraits. However, his summers are also filled with storm chasing. He's the first storm-chasing wedding photographer I've heard about!